One of the distinguishing features of brownstone Brooklyn are the ponderous cast-iron railings, gates and balustrades that adorn its elegant Victorian row houses. Cast iron, as the name suggests, is made using molds into which liquid iron is poured. Though now associated with some of the priciest homes in town, cast iron became popular because it was a cheap alternative to wrought iron—iron smelted slowly at low temperature and “wrought” by hammer blows to purge impurities and give it shape. Most architectural hardware prior to the 1860s—hinges, pulls, latches, shutter dogs—was made in this way, often by village blacksmiths of the sort immortalized by Longfellow. Cast iron, smelted more rapidly at higher temperature, contains more carbon and other impurities than wrought iron, and is much more brittle as a result—it will literally shatter if struck hard enough with a hammer. But, easily poured into molds, cast iron enabled the mass production of a wide variety of architectural details—including entire building facades, like those pioneered by James Bogardus in lower Manhattan. Molded into forms massive enough to mimic stone or wood, cast iron did much to encourage the ornamental excesses of the Victorian age. 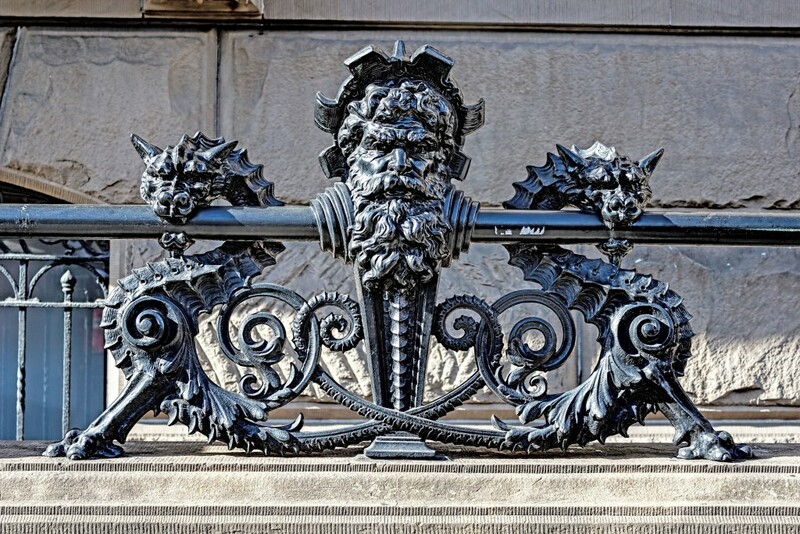 It soon evolved an aesthetic all its own, yielding metalwork the village smithy could hardly have imagined—elephantine banisters on Park Slope brownstones, for example, or Samuel Yellin’s fantastic Neptune-and-sea monster railings around the Dakota on Central Park West (manufactured by Hecla Iron Works of Williamsburg). If cast iron is the signature metal of brownstone Brooklyn, that of New York’s later neighborhoods has long been wrought iron. This should really read “wrought” iron, for it is not the hand-hammered true wrought iron of old, but cold-rolled or “mild” steel available to the trade in a variety of standardized bars, straps and rods. Strong and highly malleable—it has a relatively low carbon content—the new metal was cheaper and more versatile than cast iron, and could be easily be fabricated into railings, fences, gates and grills. 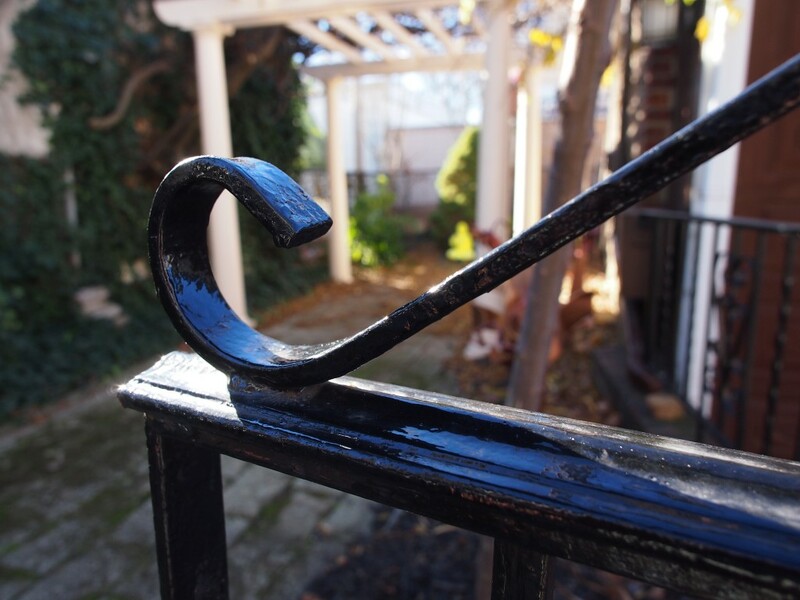 Exterior metalwork of this kind, universally—and inaccurately—called wrought iron, became popular throughout the city after World War II, as advances in welding technology reduced fabrication costs. It was an affordable way to secure property against threats real and imagined. By the 1970s, wrought-iron fences, gates and window grilles—typically painted black or white—were as much a part of the outerborough streetscape as potted geraniums or London plane trees. In the last decade or so a new type of architectural metal—shiny stainless steel—has spread through the boroughs, one reflective of the city’s ever-changing demographics. 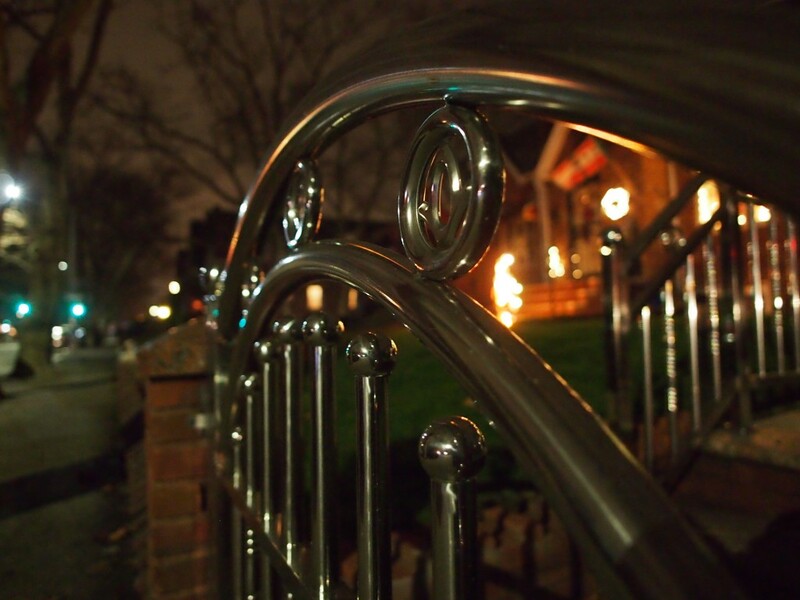 Wrought iron fabricators of the 1970s were often Italian; those working in stainless steel are almost always Chinese—typically from Fujian or Guangdong provinces. The earlier metalcrafters developed something of a outerborough vernacular—rich in twisted bars and strap-iron arabesques. Their stainless contemporaries, on the other hand, have imported an aesthetic straight from China. 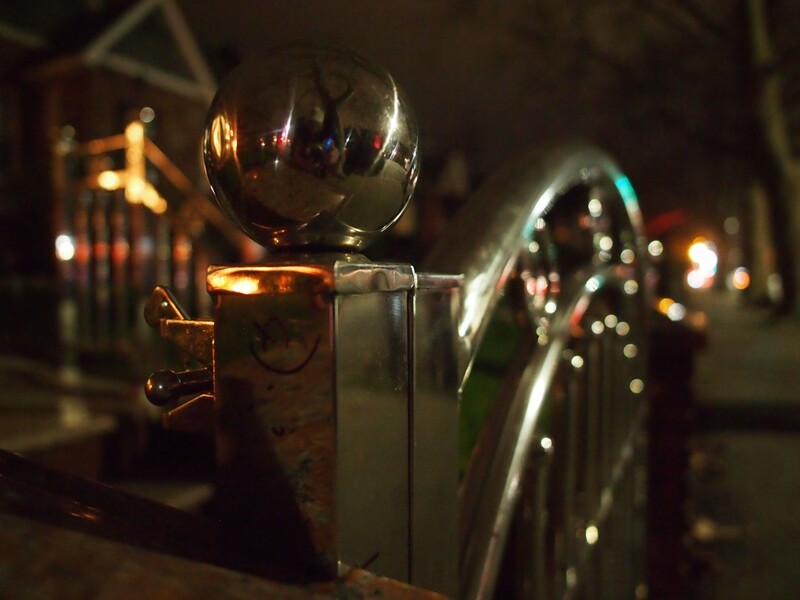 Anyone who has spent time in Brooklyn and Queens knows the look—gleaming steel grilles, gates, handrails and security doors constructed of tubular stock, round or rectangular, and punctuated with chrome or polished brass finial orbs, roundels and linked diamonds. Travel to Guangzhou, Shanghai, Tianjin or any other Chinese city and you’ll see much the same thing. Globalization is literally at the garden gate. Given these roots, it’s no surprise that stainless steel was initially limited to New York’s Chinese neighborhoods. But it is spreading fast, and for a variety of reasons—not the least of which is price. As with so many things these days, low Chinese labor costs—both in China and among fabricators here—have made what was once a lux material newly affordable. It is also relatively maintenance free. Cast and wrought iron requires repainting every few years; stainless steel only needs to be wiped clean to maintain a mirror-like finish. There is also the bling factor. Gary Higbee of the Steel Institute of New York suggests that the popularity of exterior stainless metalwork is a function of the decade-long rage for stainless kitchen appliances. The geography of stainless steel is a study in itself. Fabricators are mostly located in major outerborough Chinatowns—around Sunset Park in Brooklyn and, especially, in Flushing, Queens, where they operate (appropriately enough) in the shadow of the Unisphere, the borough’s towering stainless symbol of global unity. Chinese fabricators I’ve spoken too said that half their customers are African-American homeowners, about 30 percent Chinese and the balance white or Latino, with the folks from the former Soviet Union especially well represented. My own sidewalk surveys suggest popularity across a broad spectrum of class and ethnicity. In some sections of Brooklyn—East Flatbush, Brighton Beach, Bensonhurst—almost every block has two or three stainless jobs. The metal is almost wholly absent in the older, gentrified sections of the city. Of course, not everyone is happy about the newcomers to the metal scene. The city’s older fabricators, who have seen a good chunk of their business vanish, charge that Chinese companies can sell steel on the cheap because they grossly underpay their workers. They also quibble about the quality of the steel and the way it is used. As one Brooklyn worker bluntly put it, “In the industry we call this stuff ‘stainless crap’.” Homeowners are often seduced by the shine of stainless, he said, and fail to understand that the material may not even be all that durable; cheap tubular stock, for example, often rusts from the inside out. According to him, low-end fabricators fuse steel with “tack” welds, rather than stronger full-bead welds. My own observations in China suggest he may be right—metalwork just two or three years ago has not aged well, the polished surfaces dulled now, welded joints each encircled by a halo of rust. For the inquisitive urbanist there is a simple trick to test, as it were, the mettle of the metal: “If a magnet sticks to a stainless gate or fence,” says Higbee, “then it’s not a high grade or austenitic steel, and will not have the corrosion resistance that people typically purchase stainless for.” As Thomas Devine of UC Berkeley explained in a 2006 Scientific American piece, the reasons “are quantum-mechanical in nature.” I’ll let him explain . . . Welcome to my website! I am an urbanist and historian with a keen interest in landscape, place and the built environment. 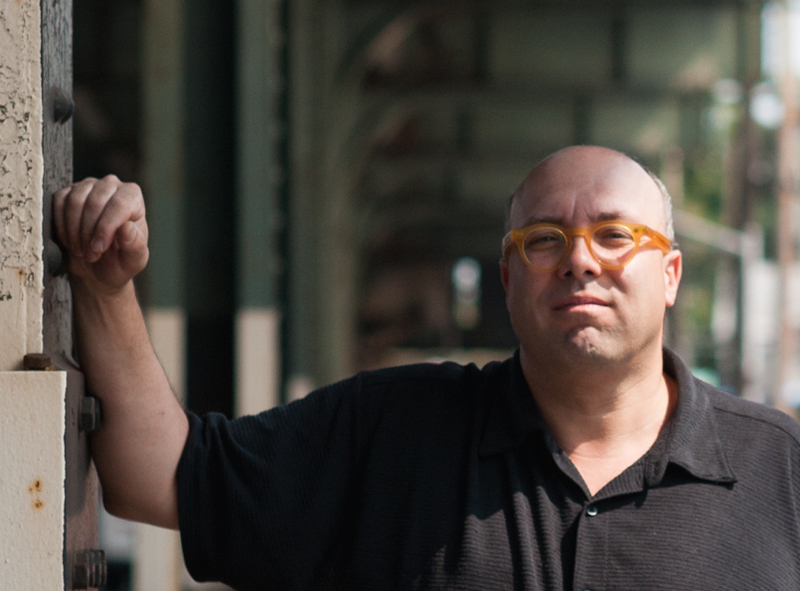 I split my time between the Brooklyn neighborhood where I grew up and Ithaca, NY, where I am a professor at Cornell University and director of the Urban and Regional Studies Program.